Ministers Shane Ross and Kevin ‘Boxer’ Moran were joined by Fáilte Ireland CEO Paul Kelly at the Hodson Bay Hotel last Thursday to reveal the new tourism brand for the Midlands: Ireland’s Hidden Heartlands. The new band will promote the ‘heart’ of the country, from Leitrim down to East Clare and extending through Longford, Roscommon, East Galway, as well as parts of Westmeath, Cavan, North Tipperary and Offaly. It will operate alongside Ireland’s Ancient East, the Wild Atlantic Way and Dublin to boost tourism across the entire country. Speaking at the launch, Minister Ross said the brand will enhance the Midlands as a tourism experience and bring growth and jobs to the region. “We have always been committed to ensuring that Ireland’s success as a world-class tourist destination is shared among the regions. Some of the country’s finest natural assets are in the Midlands, including spectacular lakes, walkways and blueways. Ireland’s Hidden Heartlands will bring these gems to life, offering a unique experience to both domestic and international visitors,” he said. 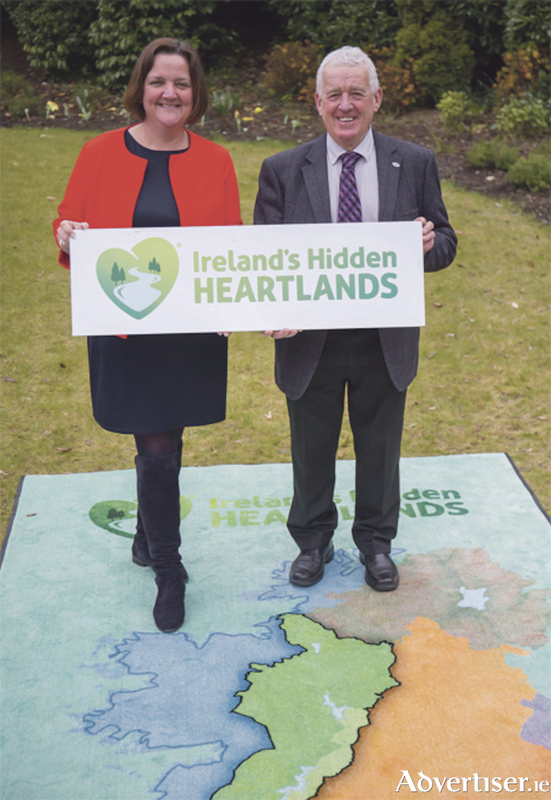 Minister Moran added that ‘Ireland’s Hidden Heartlands’ will transform how the Midlands is presented to tourists. “I’ve heard first-hand from people and businesses across the region about the major potential this area has to attract visitors and the willingness there is to grow tourism,” he said. “It is fantastic at last to have a tailored brand for the Midlands, as this is just what we needed to develop local tourism and unite our visitor experiences behind an offering of scale. Paul Kelly of Fáilte Ireland, said the new brand has been developed after months of market testing in Ireland and overseas. “The overwhelming feedback is that visitors from key markets want the opportunity to explore Ireland’s natural gems and rural communities. There is also a huge appetite out there for tourists to be active in nature through activities like walking, cycling, angling and boating routes, all of which the Midlands can offer in abundance,” he commented.